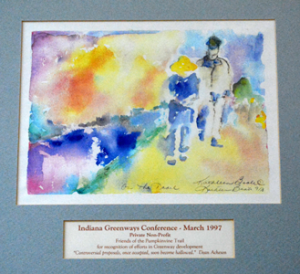 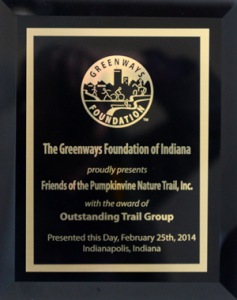 At the Indiana Greenways Conference, March 1997, the Friends received the Private Non-Profit Award in "recognition of efforts in Greenway development. 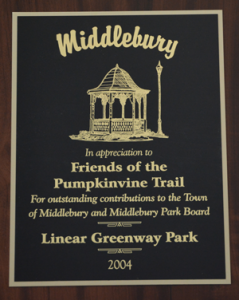 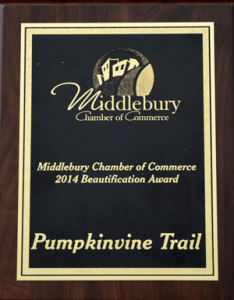 In appreciation of the Friends of the Pumpkinvine Nature Trail for outstanding contributions to the Town of Middlebury Park Board: Linear Greenway Park. 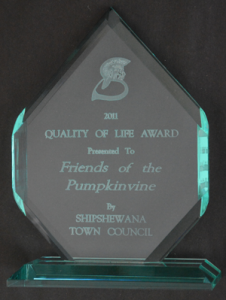 February 21, 2012, The Friends of the Pumpkinvine Nature Trail, Inc. received the 2011 "Quality of Life Award" from the Shipshewana Town Council at the Retail Merchants Association annual banquet. 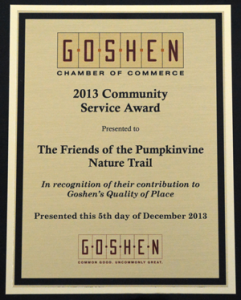 Roger Yoder, president of the Town Council who presented the award, said the award was in recognition of the positive impact the Friends of the Pumpkinvine had made to improve the quality of life for the residents of Shipshewana by championing the creation of the Pumpkinvine Nature Trail.